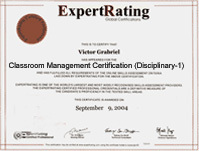 (leading to ExpertRating Solving Classroom Discipline Problems Skills Certification). Why do some teachers enjoy peaceful, orderly classrooms while others face daily discipline battles? The answer is that some teachers know the secrets to solving discipline problems. This course reveals those secrets and presents a step-by-step approach to effective, positive classroom discipline. This course includes a knowledgeable and caring instructor who will guide you through your lessons, facilitate discussions, and answer your questions. The instructor for this course will be James Thompson. About the ExpertRating Online Teaching Course (Solving Classroom Discipline Problems I) instructor : Dr. James Thompson holds a Ph.D. in Instructional Communications and has over 25 years of experience as a teacher. His distance learning courses, workbooks, and videotapes have been used to train more than 250,000 educators in the art of student discipline. His works include: Teaching Students Responsibility, Dealing With Discipline Problems, Human Relations and School Discipline, Assertive Discipline and Beyond, and Dealing With Difficult Students. Solving Classroom Discipline Problems requirements: For taking this instructor led ExpertRating Online Teaching Course (Solving Classroom Discipline Problems I) you need Internet access, email, and a Firefox, Netscape, Navigator or Microsoft Internet Explorer Web browser. "As an elementary teacher this "refresher course" reminded me of many things too important to forget. I am very thankful that this course was offered and much new information was gained as well. My students will reap the rewards of this study! Excellent!" "As a third year teacher this course was very timely. It made great sense and I am utilizing what I learned." "Awesome class with very concrete ideas and research to back it up. Would love to take another online class by this instructor." "Even as a veteran teacher, I felt that I benefited from the content of this class." "I actually enjoyed taking this class and did learn quite a bit about how to and not to handle problems in the classroom." "I cannot begin to tell you how valuable this course is to me as a teacher, and even more valuable to me as a parent. We do not take an instruction manual home from the hospital, just a squirming, completely dependent little blanketful. If only I had this course to read while I was nursing... this can be applied all of our children's lives, little by little. It's knowing when and how to listen, feel, teach, empathize, hold the line, or let the line out a little, and so much more. I have learned so much of what I may have not done correctly, and thankfully, some things I did ok...I just wish everyone who either teaches or is entrusted with a child had to read all this information, and somehow absorb not just its words, but its intent. I will teach this material through my teaching and parenting, and hopefully, help someone along the way. Thank you so much for helping me become a better teacher and mother." "I enjoyed this course very much! Thanks for all of the great info and resources." "I found the course material very helpful and timely. It reinforced many of my practices and challenged me to change others or to refine my approach to certain situations." "I found this class to be very informative and helpful on the subject of classroom discipline. I would highly recommend this class to everyone in the educational field." "I found this class to be very interesting and informative. It helped me to look at behavior in a different way and understand the needs that we all have. I enjoyed looking at the various kinds of student behavior and gleaned some good strategies for dealing with them. It was a wonderful course and I hope to take more classes over the internet." "I have attended many workshops and seminars on behavior management, but I consider your course to be one of the "BEST!". Your lessons were well organized and full of ideas that I took straight to my classroom. Thank you!!" ExpertRating is one of the world's only ISO 9001:2015 Certified companies (from TUV America) offering an Online Teaching (Solving Classroom Discipline Problems I) Course (leading to ExpertRating Teaching (Solving Classroom Discipline Problems I) Skills Certification). When you choose the ExpertRating Online Teaching Course (Solving Classroom Discipline Problems I) you can be sure that you are buying a premium International certification that is recognized by hundreds of employers and Government bodies in the US and other countries. With ExpertRating you get certified quickly online and you are equipped with a store house of information through the in-depth ExpertRating Online Teaching Course (Solving Classroom Discipline Problems I) Courseware which has been developed by experienced Teaching Experts. 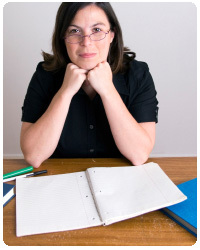 You can buy this ExpertRating Online Teaching Course (Solving Classroom Discipline Problems I) leading to Classroom Management certification at a special offer price of only $129.99 which includes the in-depth ExpertRating Online Teaching Course (Solving Classroom Discipline Problems I) Courseware and exam fee. This is the best value for money Classroom Management Program available till date. You get the following services within the USD $129.99 fee. In-depth ExpertRating Online Teaching Course (Solving Classroom Discipline Problems I) Courseware including scenarios and case studies. The process of getting yourself certified is very simple. All you have to do is buy the ExpertRating Online Teaching Course (Solving Classroom Discipline Problems I) for $129.99. Log in to the instructor led course using your password. Go through the ExpertRating Online Teaching Course (Solving Classroom Discipline Problems I) Courseware (which would take you 6 weeks) and complete the final Classroom Management Certification exam at your convenience. You can complete the exam within 2 months of buying the Classroom Management Certification. The result of the exam appears as soon as it is completed, and your Classroom Management Certificate is mailed immediately. The final exam is fully based upon the ExpertRating Online Teaching Course (Solving Classroom Discipline Problems I) Courseware that is provided along with the Classroom Management Certification. If you have gone through the courseware properly you should not have a problem clearing the exam. The exam consists of multiple choice questions from all chapters of the ExpertRating Online Teaching Course (Solving Classroom Discipline Problems I) Courseware. If you are a beleaguered teacher who experiences a nervous breakdown because of your students’ behavior then Solving Classroom Discipline Problems is just the right course for you. The Solving Classroom Discipline Problems course will teach you the necessary skills to solve the discipline problems. This valuable course will discuss in detail the discipline problems faced by the teachers; how to handle the most challenging students and offers the practical help anxious teachers are looking for. This course will guide you maintain the much needed control and order in the classroom and make learning more effective. This course is not only useful for teachers, but also for those parents who have chosen home schooling for their children. The course will surely guide you to solve minor misbehavior problems to serious assaults in the classroom. The ExpertRating Solving Classroom Discipline Problems Certification course will unveil the secrets of creating and maintaining discipline in the classroom. I've Got A Secret! In this first lesson, you'll learn a very important secret about children and discipline. Once you know the secret, you'll be empowered to solve all classroom discipline problems, whether minor or severe. Armed with your new knowledge, you'll be on your way to a more peaceful, respectful, and productive classroom. Children Need to Behave - This lesson explores what motivates student behavior. People come into the world with a set of needs, and for the rest of their lives, they struggle to learn how to best meet those needs. In this lesson, you'll examine students’ needs and learn how to teach to them to meet those needs responsibly. Now You're Going to Get It - You probably already know what approaches don't work with students, but this lesson will explain why they don't work. You'll learn about the brain’s three control centers and how they affect your students’ behavior. You'll also learn how to avoid ineffective responses that can only make problems worse. And the Winner Is... - When discipline is practiced correctly, there are no losers, only winners. Teachers win because they are able to have their needs met without imposing authority or control. Students get their needs met because they get a say in the process through the use of choices. This is the win-win approach to discipline. You've Got to Have a Plan - You have to have a plan. If you just react as situations present themselves, you are going to continually have problems. This lesson will help you create a game plan for effective classroom discipline. With this plan, you and your students can agree on which behaviors are acceptable and which are not in your classroom. What to Do When - Now that you have a plan, what do you do when students choose to misbehave? What do you do when they behave responsibly? This lesson will talk about actions you can take when students choose to ignore boundaries. In addition, you'll learn about the reinforcing actions you should take when students choose to act responsibly. Problems and Maturity - Now that you're halfway through the course, it's time to put your new knowledge into action. In the remaining lessons, you learn how to apply what you've learned to discipline problems that commonly occur in any classroom. You'll learn how to deal with these specific problem behaviors: the attention-demander, the apple-polisher, and the whiner. Problems With Others - This lesson focuses on solving problems that involve how students relate to and interact with each other. You'll learn steps that you can take that will both stop the inappropriate behavior and teach appropriate, responsible behavior. You'll learn how to effectively deal with these types of students: the arguer or excuse maker, the bully, and the fighter. Problems and Defiance - In this lesson, you'll learn active listening and other techniques that you can use to defuse emotional situations. You'll learn how to effectively deal with students who continually behave in ways that push your emotional buttons and try your patience. You'll learn what to do when confronted with the defier, the disrespectful, and the disrupter. Problems and Schoolwork - Behavior problems often result in poor academic performance, either directly or indirectly. This lesson gives you a practical approach to helping students who have chosen to not work to their full potential. You'll learn how to help problem students such as the do-nothing, the cheater, and the homework hater. Problems and Independence - In this lesson, you'll examine discipline problems that arise out of students’ need for freedom and independence. These problems occur more frequently in the preteen and teenage years, but independence can be an issue at any age. If you are a parent as well as a teacher, you'll be interested in this lesson that shows you how to successfully deal with the procrastinator and the rebel. Let's Try Again Tomorrow - What do you do if you try these new approaches but they don't work? That's the subject of this last lesson. This lesson will look at some additional strategies you can use to solve severe or recurring problems. The course ends on a positive note with a reminder of all of the good reasons why people chose to become teachers in the first place.